House smelling bad or having kids going to college? Stock up on Glade wax warmers before the school starts and they move out. When they move into the dorm, they will need some sort of air freshener. The Glade wax melter is a pretty good option. It melts up the wax and fills up the whole room with any smell you pick. It’s almost like grandma’s apple pie baking in the oven…yum!!! 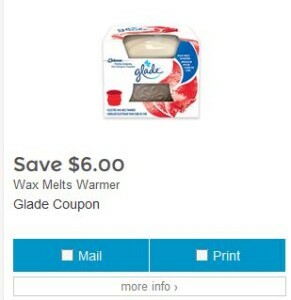 ok, enough dreaming about apple pie a la mode, you can find the Glade Wax Warmer coupon at Save.ca. This is what the coupon will look like. All you have to do is pick either to have them mail or you can print the coupon directly to your own printer. Coupon is valid only in Canada. The perfect fragrance can make our great rooms even greater. Glade Wax Warmer melts and fills even the largest rooms with fragrance with a stylish, electric table-top warming dish. Available in a wide variety of your favorite Glade scents, Glade Wax Melt cubes deliver up to 96 hours of fragrance per pack. 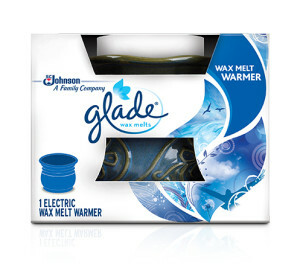 You can find Glade wax warmers in any supermarket, Walmart, drugstores and super centers in Canada.